What would you do if you won a weekend in Paris? Stroll around the Champs-Élysées? Go for a boat trip down the Seine, visit the Louvre, or simply frequent the many wonderful cafés, bars and restaurants? I must say I can’t really choose – Paris is probably one of my top 5 dream destinations. If it ranks as highly in your affections, then you must enter Leisure Jobs competition to win a perfect weekend in Paris! Entering is really very simple – just make sure you read the terms and conditions. 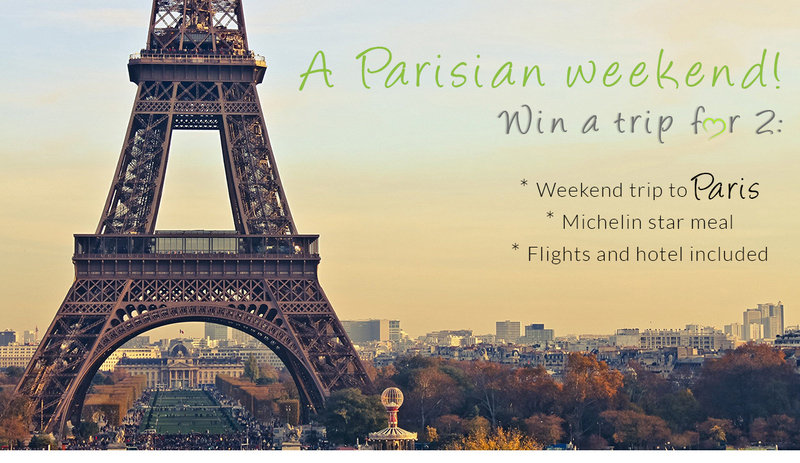 The competition is running until the end of October and the prize is a weekend for two in Paris (inclusive of flights and hotel) plus a Michelin starred meal. I may just be entering myself! (this one is the one I used) has to be the first step. Chilling the batter overnight is important. Finally, carefully greasing the moulds is paramount, even if you have a non-stick tin. Trust me.
. The pumpkin spice twist worked really well – these were wonderfully aromatic and just perfect with a cup of coffee. The salted caramel and pecans are entirely optional if I am honest – these little sponge cakes are just fine on their own. Watch carefully while the madeleines are baking – they can catch quite easily, as you will see some of mine are a little dark. If you are wondering what to do with the rest of the pumpkin purée, I got you covered. How about some Pumpkin Gingerbread Rolls or this amazing Pumpkin Praline Layer Cake? Make the madeleine batter one day ahead. Melt the butter in a small saucepan, cool slightly and mix with the pumpkin purée. Set aside. Sift the flour, baking powder, salt and spices together in a small bowl. Using a stand or hand mixer, whisk the eggs, sugar and honey until frothy and almost double in volume. Fold in the flour mixture and then use a hand whisk to gently mix in the melted butter/pumpkin until well combined. Transfer the batter to a piping bag fitted with a small round tip (clip it on both ends so the batter doesn’t run out). Chill in the fridge overnight. The next day, melt about 2 tbsp of unsalted butter and carefully grease your tin using a pastry brush. Lightly dust with a little flour and shake off any excess. Chill in the fridge for 15 minutes. Preheat the oven to 200C (400F). Pipe the batter into the mould filling about 3/4 of the way up. Bake for 10-14 minutes (this will depend on the size of your tin) or until the madeleines are golden, puffy – they should also have a characteristic little bump. Cool in the tin for 5 minutes then forcefully knock the tin against your worktop – the madeleines should fall out of their own accord. If they are being stubborn, insert the tip of a knife to slightly loosen them from the tin. Serve warm, drizzled with a little caramel sauce and chopped pecans. Items marked with an asterisk are affiliate links. This post has been sponsored by Leisure Jobs. I love these, they are perfect little madeleines. The flavour combinations are so clever too, the pumpkin spice takeover of 2015 is beginning! Pinned! Love Paris, Love Madeleines, Love Pumpkin, Love this post! A weekend in Paris and a Michelin star meal sounds fabulous right now after I just pulled a packet of frozen dumplings for dinner! I love your pumpkin madeleines, Lucy! Gorgeous photos as usual. 🙂 I wish I had a couple of those beauties for dessert right now! I think we two should go on a weekend (or even a day) to Paris. It's food blogger heaven!